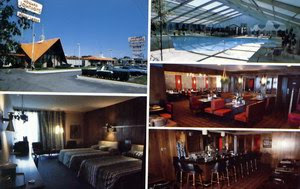 I hate to do this after the comment below about the first HoJo's postcard, but here's another glimpse of Howard Johnson's Motor Lodge. I Spent my Honeymoon with my first wife there in 85 LOL. We didn't even last a year. God I hate Flint. I don't remember it as a HoJo, but that is for sure what I remember as the Econo Lodge on Center Rd across from Courtland. In the early 90's we would rent a room to swim in the winter sometimes.